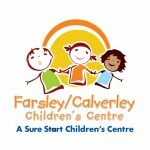 Farsley & Calverley Children’s Centre is located in the Infant building at Farsley Farfield Primary School. We offer a wide range of Children’s Centre Services for children and families in the local community. We have a community room, a family room, and baby changing facilities. Additional space in the school is used for parents and toddler, creche and holiday activities. Groups and activities are offered for parents to be and for parents/carers with children aged 0-5. These include Well Baby Clinic, Baby Massage, Play and Learn, Parent and Toddler, Parenting Groups, Adult Education and Training and Volunteering. Our Whats On gives the latest information. Family Outreach workers are available to support families with children aged 0-11. Some families ask for support with a specific issue, whiles others want to chat through worries or achievements. Referrals can be made by families and by other agencies. If you have a Facebook account, search for our Farsley and Calverley Children’s Centre page where you will find information and details of activities taking place. To see a copy of the latest Ofsted report click here. Click here for the Leeds Family Information Service.